In the time it takes the average guest to explain how many years that a Lazy Susan has been in the family attic collecting dust on Antiques Roadshow, professional junk pickers Mike Wolfe and Frank Fritz could’ve probably found a half dozen items of “rusty gold” in the same given attic that they could then turn around and make a few bucks on. The main difference between the two series is simple—on Roadshow we get the “tell,” and on Wolfe and Fritz’s American Pickers we get the “show,” the “tell” and a little bit of adventure as well. Essentially in the world of antiquing, American Pickers is Indiana Jones meets Antiques Roadshow as every week the two men journey around the back roads of middle America scouting for any sign of junk, whether it’s in piles of rusty belongings stacked up next to old barns nobody’s been in for decades or lawns that have turned into HOA nightmares and collectible maze-like museums of vintage cars, porcelain advertising signs, carnival rides and more. With the LeClaire, Iowa shop Antique Archaeology serving as owner Wolfe and childhood friend turned business partner Fritz’s home base, their tireless assistant Danielle Colby-Cushman scours blogs online and calls leads repeatedly trying to tip off her “boys” on where the two men should go next. 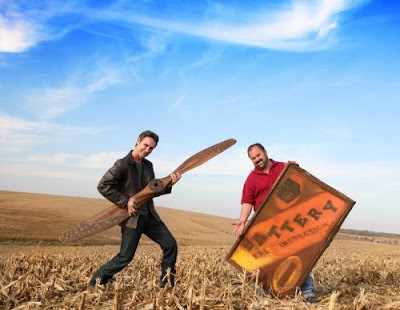 Despite the source work, the History Channel original reality series is at its best when the two men take part in what they call “freestyle picking,” aka putting in enough windshield time keeping their eyes peeled for older homes they visit cold in the hopes that whoever lives on the other side of the door will let them browse around. Having done this sort of work professionally for two decades, Mike in particular is an old pro with a lot of advice to give on “Picking 101” such as always letting the potential seller name the price so they don’t get thrown off the property for insulting the owner or wasting their money by bidding too much. While occasionally the duo need to be reminded about picking etiquette when they spend roughly an hour inside a barn, leaving the owner out in the sun, overall the two are nice, easygoing and exceptionally honest Midwesterners who practice what they preach including the importance of letting the home owners tell their stories first as they look around and soak up the scenery before starting to rattle around dresser drawers and open up duct taped boxes. Likewise repeatedly they demonstrate how much of an impact it makes once the two are able to carry out a vital first ice-breaking purchase to open up the exchange between the guys and the sellers. And their technique of asking “how much would something like this go for?” helps illustrate whether or not they can buy anything at all or if what they’re looking at is “NFS” – not for sale – which translates to Mike and Frank that they need to move elsewhere in order to make a buck. And although they take a fairly large vehicle with them, as they move further into the south and Mike takes a gamble on pottery, it’s interesting to see the way the duo relies on Danielle and those in the know from experts on Vespas or movie posters in seeing if they can unload some of their purchases along the way to make a quick buck and put certain items like automotive parts in the hands of people who will then turn around and put them to good use. 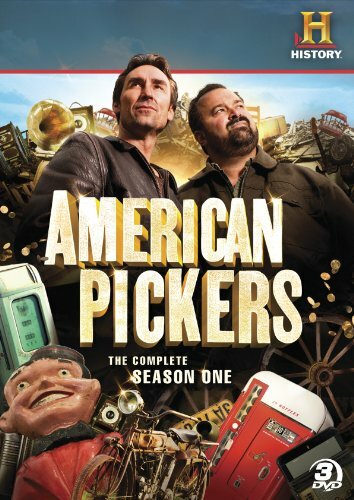 Admittedly when viewing the initial twelve episodes of the first season back to back across three DVDs, their methods, one-liners and the show’s focus on “livin’ pickin’ junkin’ diggin’” to quote the two does grow a bit repetitive. Namely, far too often we see the same type of rusty goodies from one place to the next and because of this limitation, it’s impossible to satisfy a wide range of viewer curiosity when we’re too preoccupied on say, oil cans and signs as this critic in particular was drooling at the prospect of thousands of old original unexplored movie posters. Nonetheless overall it’s a truly likable and far more adventurous take on antiquing than one would expect that will hopefully continue to explore more of the process than just the picking in future seasons – whether it’s in how Danielle gathers leads or what happens to the items once they’re brought back to Iowa – in order to truly make viewers feel as invested and fascinated as we were during the opening few episodes that introduced us to life as a picker.